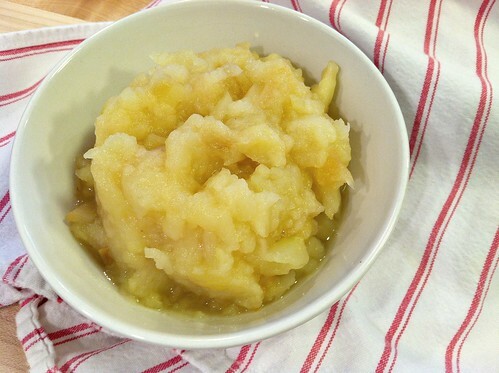 8-Minute Applesauce… in the Microwave! Remember my post from a few weeks ago about how I salvage fruit and vegetables that are a little past their prime? 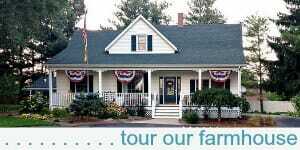 Well this year, that is more true than ever before because prices for fresh produce are abnormally expensive due to a very warm March, and then a drought for most of July and August. Thankfully, I only can and preserve fruits and veggies every other year — and this was my “off year” — so I didn’t have to buy bushels of produce at such expensive prices. However, even buying produce to eat and bake with makes a hefty dent in our grocery budget; so I’ve made it my mission to use every morsel of produce I bring home! I’ve also been scouring the reduced price produce racks every time I’m at the store. Well last week, I hit the jack pot and got a HUGE bag of Michigan apples for only $2.00 on the reduced rack! And while most of them were completely edible, there were a handful that we definitely would not eat raw. I thought about making a pie, but since I had just finished a massive all-afternoon bake-a-thon, I wasn’t jumping up and down about baking again. 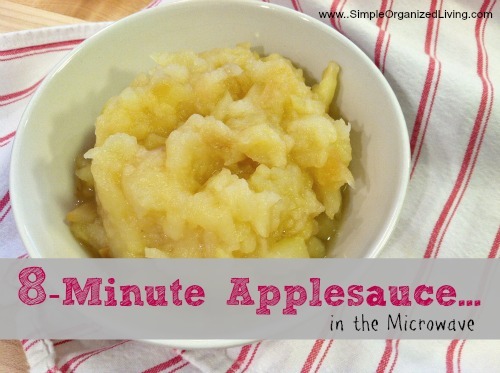 So I decided to make a very small batch of applesauce — in my microwave! Yes, I could have made my applesauce on the stove, but I’ve just been having so much fun using our brand new GE Café microwave lately, and I figured the process would be much faster and less messy in the microwave. 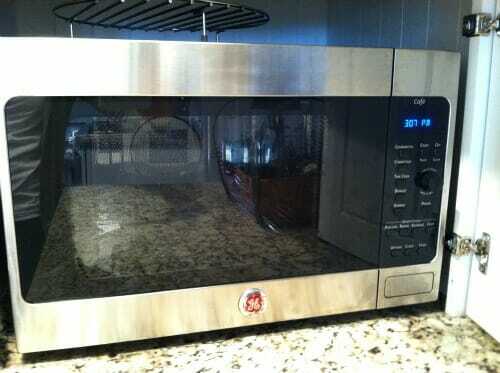 OK, so before I share my simple “recipe”, I have to tell you about our new microwave. 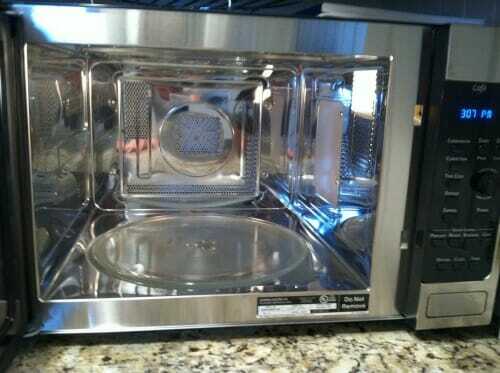 Last month, when I blogged about our brand new GE kitchen appliances, I mentioned that our microwave was just a little cheap thing we had purchased for $5 from Craigslist. 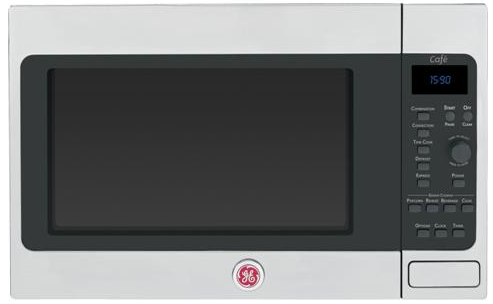 So the very next day, I was thrilled (and completely surprised) when I received an email from GE saying that they’d love to upgrade us to the GE Café Convection/Microwave oven — that just so happened to match all our other GE Café appliances! Isn’t it pretty — and big! 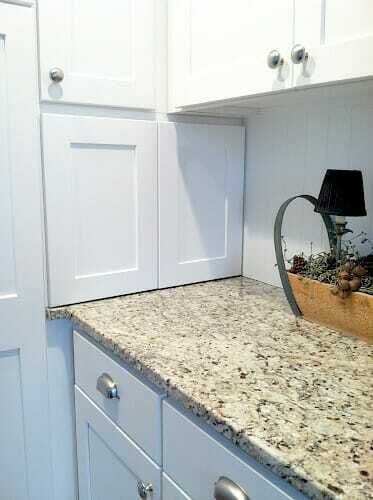 I love all the fabulous features that have really helped to simplify and organize my time in the kitchen. For example, this microwave does everything “normal” microwaves can do — but it also has a little button that I can push to transform it into a convection oven (which means I can actually cook and bake in this microwave). It preheats just like an oven (in about 3 minutes! 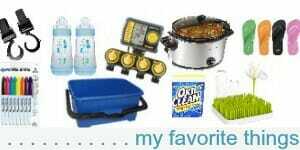 ), and cooks your food in WAY less time. Just the other day, I forgot to put the rolls in the oven, so instead of stalling dinner, I simply stuck them in the microwave on the convection setting. Less than 6 minutes later, we had fresh-from-the-“oven” dinner rolls! OK, back to my microwaved applesauce. I used the convection feature on my microwave to make the process move a little faster, but you CAN still make this recipe even if you don’t have a convection microwave. 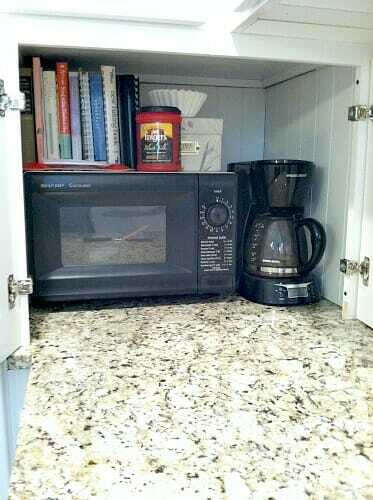 In fact, the recipe below is for regular microwaves — so you shouldn’t need to make any changes. 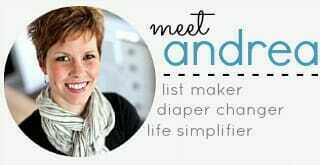 This recipe makes about 2 cups of applesauce. 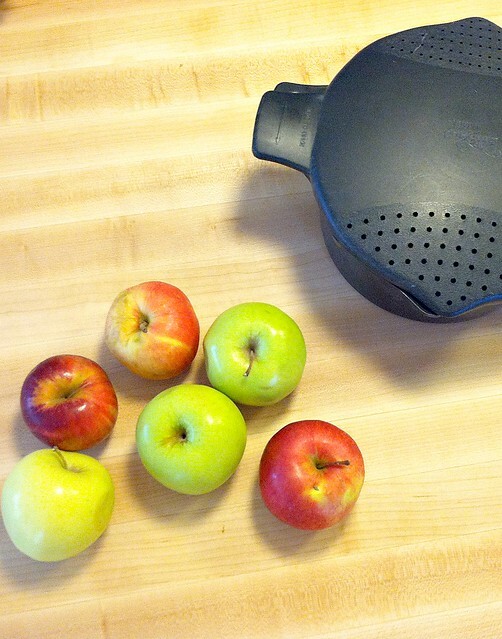 Store any extra applesauce in a sealed container in the refrigerator. It should last for at least a week or more. When my mom and I can applesauce in bulk, we leave the peelings on and use a food mill, but for this small of a batch, it’s just easier to peel them first. 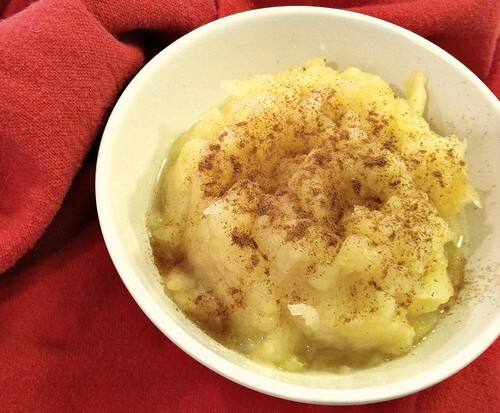 This applesauce tastes absolutely delicious, and it will make your house smell like you’ve been simmering apples all day long! Thanks to GE for the awesome new microwave — it’s the cherry on top of our delicious kitchen renovation! 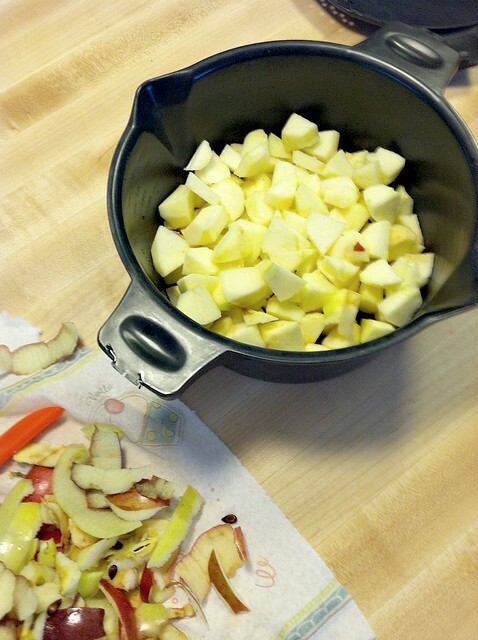 What is your favorite way to use up mushy apples? Looks great! I have a grocery trip planned for the morning. You can bet I will be checking out the apple bin! Yum, thanks for this recipe. I usually make it in the small crock pot, this looks much better and I won’t have to plan way ahead of time. This looks awesome. This is a great easy winter breakfast or dessert that we will be making soon!